On September 23rd, prisoners in the administrative detention unit at Menard Correctional Center in Chester, Illinois declared a hunger strike in response to the administration’s continued unwillingness to respond to their demands for relief from their conditions of long-term solitary confinement. See below for their list of demands and description of their conditions. 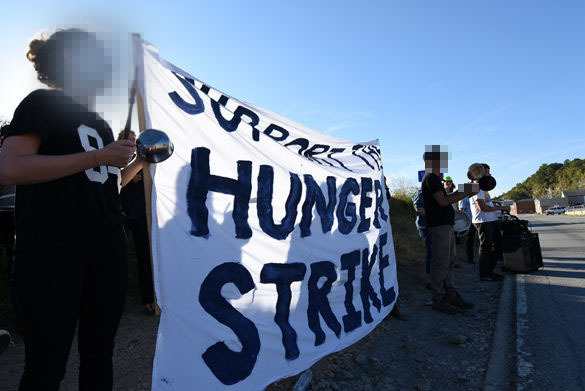 This strike is a continuation of a series of hunger strikes by the prisoners there, which began in January 2014. On the first day of the hunger strike, about 25 of us converged on Menard Correctional Center in Chester, Illinois from multiple cities with music and drums, yelling and banging pots and pans to make noise for those inside to hear us standing with them. In response, prisoners banged on the walls of their cages and screamed back through shuttered windows “Freedom,” “We hear you,” “No More A-D” [Administrative Detention] and “Hunger Strike.” With our voices hoarse, we returned home with our networks on the outside stronger and, we hope, our connection to those inside stronger as well. The separation between prison and the outside must blur more and more, especially if there are some of us who might someday find ourselves inside such cages. The noise demonstration—a tactic that is employed by anarchists and radicals all across the world—is a direct form of communication that helps to slightly break the physical barriers of prison down in the way that allows us to actually hear and sometimes see each other. For anyone who has ever been locked up in prison or jail and all the confusion it entails, just to see a face or a hear a friendly voice to break through the isolation is enough to boost spirits. This tactic does not just need to be employed in prisons in rural areas like Menard, but also be taken to the jails in our towns and cities; often a worse experience for those of us who have no money for bail, are either forced to plea out or have to wait years to even be tried. Making contact and hearing the hunger strikers voices was a powerful thing, but we cannot delude ourselves on the back to think it’s enough. Such events must become more common, as well as some creative and innovative explorations of other more direct communication methods inside prisons, in addition to making contact through writing to prisoners or calling-in to prison authorities. We do not yet have updated information about the hunger strike at Menard, but when we do we will post an update. In the meantime we encourage everyone to take action in solidarity with the comrades locked down in horrible conditions and doing all they can to resist. Here in A.D., everything is still the same. No one is being released and we are still not getting meaningful hearings. We are still not getting any written reasons or any new info[rmation] relied on for the basis of the Committee’s decision for our continued placement in A.D. We are still getting the same vague memos.